If you are a Facebook user, you definitely know its image load mechanism. For the purpose of reducing image load time to enhance customer experience, Facebook permits pages loading images as customers’ scroll. Magento Lazy Image Loader extension possesses the same functionality which loads product images on your Magento site only when customers scroll the page. By the same token, the extension easy usage drives Magento newcomers at ease. Likewise, the abilities to exclude particular controllers and paths from the effect of Lazy Image Loader extension promote the extension to be the adorable extension that needs to be added to shop owners’ carts. Support srcset attribute that is a new attribute of HTML5 replacing for src in loading images and in case there is any browser not supporting for srcset, it will use src as the normal way. Support <noscript> for image tag to support SEO in case the browsers do not understand srcset. 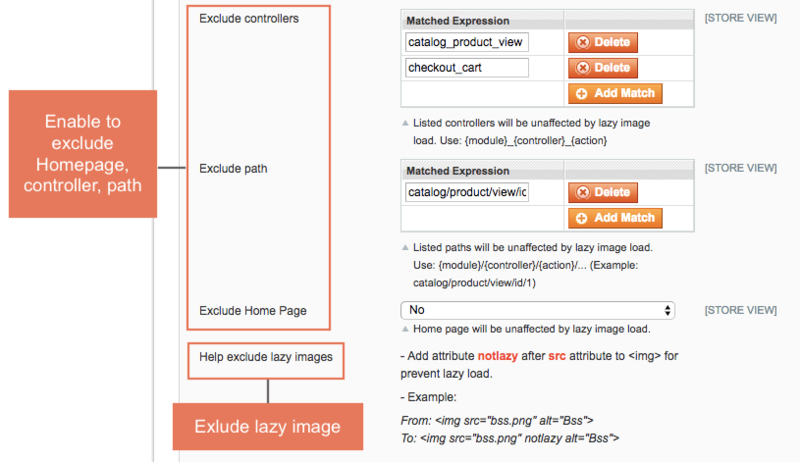 What makes Magento Lazy Image Loader the Must-Have Extension? With the similar function of loading images with Facebook, Magento Lazy Image Loader offers customers' satisfaction as they do not need to wait for their required product-images which are shown after the previously scrolled images. Unlike other Magento Lazy Image Loaders which can harm the effort of SEO for Magento site. Magento Lazy Image Loader by BSSCommerce erases the bad impacts to maintain and optimize SEO - friendly level of your Magento site. “Threshold” function on backend enables admin to decide the needed space to load the next product images when customers scroll them before images appear. For instance, when you set “0” on “Threshold”, the extension shall load product images rightly when customers scroll near them. But if you set “300”, the next pictures will be loaded when customer’ scroll is far from the next images 300 pixels. It not only disables the unwanted delay when loading images but also ensures the fast website's loading speed. 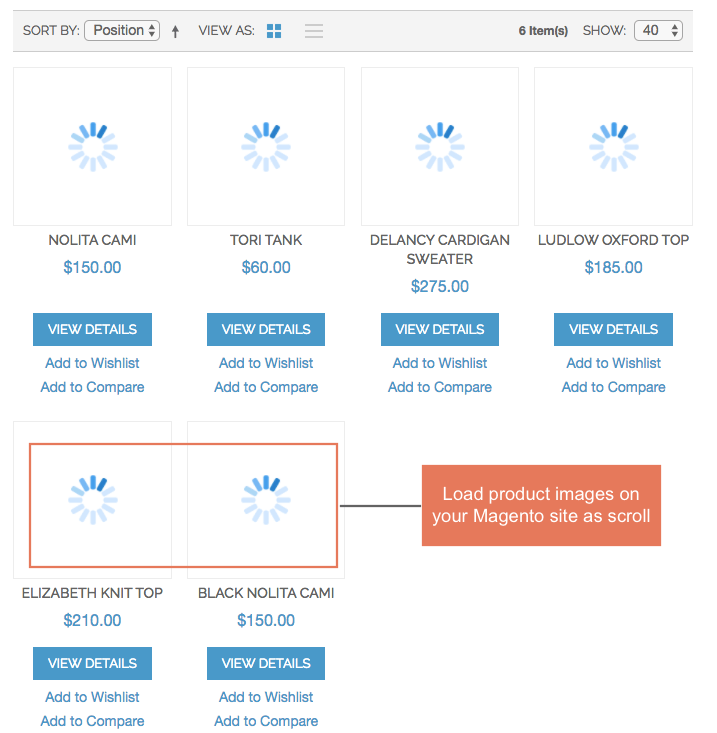 Magento Lazy Image Loader for your Magento site does not mean admins cannot exclude some parts that they do not want to load as their scroll. The extension offers admin the discretion for getting Magento pages, controllers and even homepage from the Lazy Image Loader. By clicking on options “Yes” or “No” on “Enable” box, your Magento site may be either affected or unaffected by the extension. I think I had a smart decision when choosing this extension. It worths the sum of money I have spent. I love it! I am really surprised with your product and service. Everything is perfect, I have nothing to complain. It's exactly what I need!!!! I love it! Thank you very much. I want to give a commendation for both of your developers and our supporters. You works professionally and effectively. It worked well at the first time I installed without any fault. Good job! My site now looks more professional with this extension. Why Magento stores need Lazy Image Loader Extension?